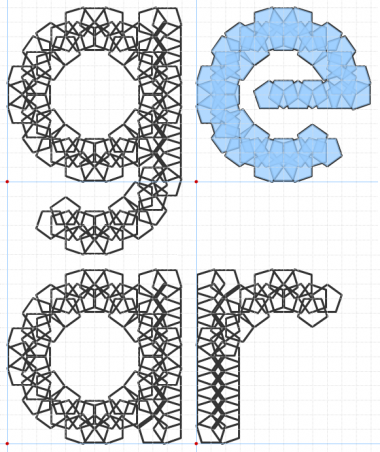 A typeface composed entirely from pentagons in different rotations (thanks to fontstruct 2.0). Info: Created on 3rd May 2010 . Last edited on 3rd October 2012. Congratulations! FontStruct Staff have deemed your FontStruction worthy of special mention. “Gearbox” is now a Top Pick. Thank you all for the nice words, not to mension the top pick. Here's an example to try and show you what I've done (If at all it makes it any clearer with all the lines). Thank you for sharing this picture. What a unique way to create letters! This is really cool. I've been experimenting with pentagon rotations for a logo I'm designing, but this is really wicked!